Entertain in style with our delightful Coconut Cheesecake Recipe. 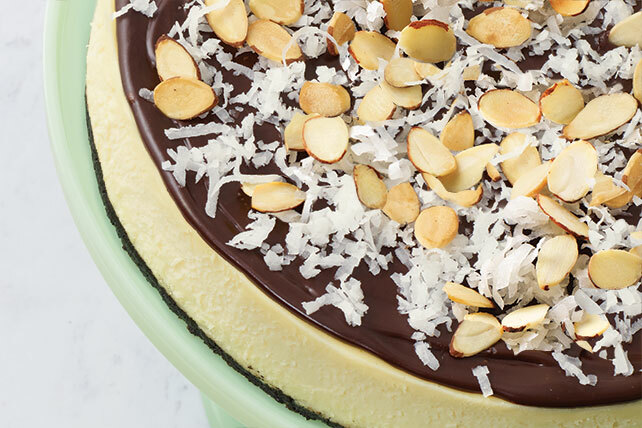 Topped with chocolate, coconut flakes and almonds, our Coconut Cheesecake Recipe is poised to be a real show shopper. Enjoy the amazing flavor of our Coconut Cheesecake Recipe with your loved ones. Combine cookie crumbs, 2 Tbsp. sugar and butter. Press onto bottom of 9-inch springform pan. Save 50 calories and 6g of fat, including 4g of sat fat, per serving by preparing with PHILADELPHIA Neufchatel Cheese and COOL WHIP LITE Whipped Topping.